и The healing practice, as well as any magic practice, i.e. any work in metaphysicum В in order to get results in physicum P, shows, that mentalum M can influence upon astralum A. In particular, a healer's/operator's thought, at its sufficient concentration, can change a patient's П astrosoma ПA. Changes in A occur due to arising of new elements in it. M turns into these elements at its substantial metamorphosis. M can change its hypersubstantial quality: it modifies at concentration, it transforms into A. Therefore A as a whole can be considered as "condensed" M, being in the constrained (astralum) state, transformed already (in the past) and introduced into A, embodied, "captivated" in A, changed its hypersubstantial (the mentalum one) specificity (for the astralum one). The comment: this statement is made by the author not only on the basis of experimental data, but also by analogy with physics concept of substance as of the concentrated energy (m = Ec–2). Accordingly, two different in principle variants of the state and functioning of the mentalum component TM of a physical object T, actually – of ahyperphysical object THp, are real. Just here a border passes between the lifeless nature (N) and alive one (K). • according to physical laws, to the second law of thermodynamics, with increase of its (the TN) entropy level, and at that its structure can become only simpler. However, the physical laws themselves may be interpreted as controlling influences upon physicum from mentalum of the Universe side (influences, also external/extraneous for any TN). Such very interpretation of the Nature (Universe) allows to consider all physical objects as animated (hylotheism). In the variant K a part TLM of the mentalum TKM of an object TK is fixed (TLM=TKA), is "astralum" one, as well as in the case of TN, but the other its part TJM is free and self-dependent, is really "mentalum" one; TKM=TLM+TJM ; this free part (TJM) controls astralumTKA by means of transformation of its elements into astralum elements and their introduction into TKA. • directly from the external astralum (astralum kind of metabolism). A border between alive (K) and lifeless (N) is not sharp, and not always easily definable. So, a virus (K) – in that even state when it is crystallized (in laboratory) – essentially differs both from diamond (N) and from milk or egg albumen (N). It remains alive: even in this (crystal) form it does not lose its virulence, i.e. keeps communication with its aggregor (and, what is the main, the virus has it) which contains the programs of penetration into a cell-host, and using of host's resources (biomaterials and energy) for its own reproduction (for the process reducing entropy of viruses mass, at increase of the [virus + host] system entropy). So, on the contrary, sperm (N) does not differ essentially from bile, saliva or sweat, despite of external similarity between a spermatozoon and falgellates (more than 7 thousand species of which is known). Spermatozoon obtains its own aggreger (belonging to a species egregor; the Homo sapiens – is not exception), i.e. becomes (but much more often – never become!) an independent organism (K), a zygote (already not spermatozoon! ), only after syngamia (chromosome fusion). In other words: a spirit SM of an individual S is NOT incarnated (inculcated, "inhaled") into its body at some stage of its development, but his (or its) aggreger – the same SM – initially supervises (directs and controls) his (of S) development, since conception (from the moment of conception, or even earlier, controlling the process of fertilization too). Therefore, using Christian terminology, not only the conception should be named as a sacrament, but the whole life cycle. As well, neither a liver cell, separated from an organism, nor an ant, separated from its ant-hill can live independently (however, also not any person can survive – as Robinson by D. Defo – without a society support) – there is not any sharp border between K and N.
The difference between K and N states is evidently illustrated by Kirlian's photos fixing an object's T aura, i.e. that part of its (of T) astralum body TA which is beyond (or out of) physical body TP limits. Alive objects K possess a bright and dynamical aura; N – stable and muffled. This difference can be explained as passivity of N-objects astralum and as active astralum circulation in K-objects, as astralum exchange processes similar to metabolism at the physical level. In a human body such exchange is most brightly shown on the acupuncture channels system – duj (China), nadi (India), meridians (see, for example, Tabeeva D.M. [ 119 ]). A moment of transition from the K state to the N is visible on Kirlian's photo taken from a Brazilian source of '70th years. 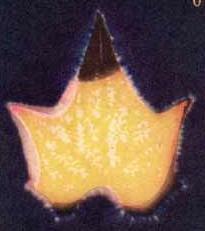 A leaf with a torn off edge, still not completely withering (recently plucked), has only partially lost aura of the whole (a contour of the initial form). •• at a trauma – on the contrary; so a pain (an astralum phenomenon) quickly accrues after a mechanical trauma, but does not come instantly, simultaneously.